It’s amazing how many inquiries we get about the practicality of a porcelain tiled garage floor. People are truly surprised to learn that it is one of the toughest and best performing garage floor options available. Despite all the evidence to the many benefits of porcelain, there are still those that are convinced it’s a disaster waiting to happen. 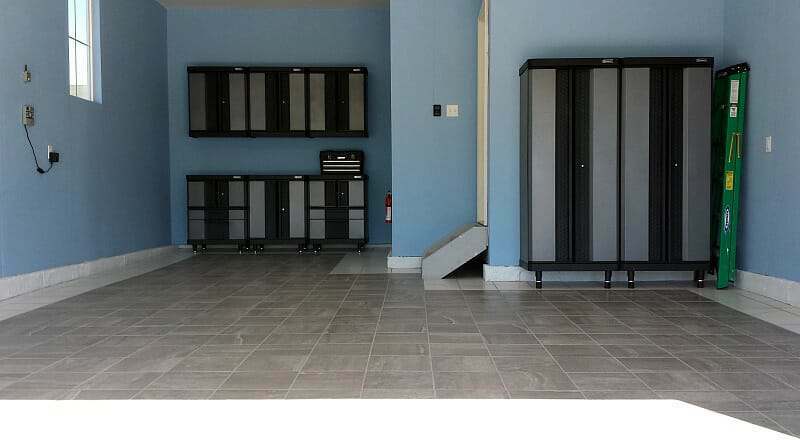 So, when Tony contacted us about submitting his porcelain tiled garage floor for our Reader’s Projects section, we were happy to display his work, as well as examine why he chose porcelain over the other flooring options available. 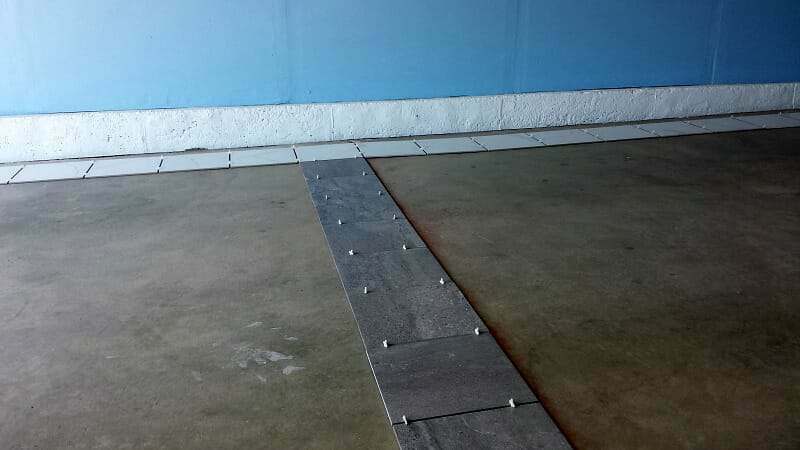 Why a Porcelain Tile Garage Floor? Living in a relatively small city in the state of Colorado, Tony needed a garage flooring solution that would stand up to the rigors of snow, ice, and road salts. Not only that, he does perform the occasional car maintenance as well as work on other projects in the garage when he and his wife Carla are busy putting their DIY home renovation skills to work. Because he was not happy with the performance of the epoxy paint kits that he had installed in the garage of his previous two homes, he knew he needed something that was much more durable and would last for years. Another requirement was that it had to look good since this was going to be the “forever home” for his wife and him. Growing up overseas, Tony remembered seeing porcelain, ceramic, and terra cotta tiles used extensively in the garages of homes in other countries. Many of these garage floors were exposed to the elements and still performed well, plus he knew how easy they were to clean. Since porcelain floors can also look very nice, it was an easy decision for him to make. 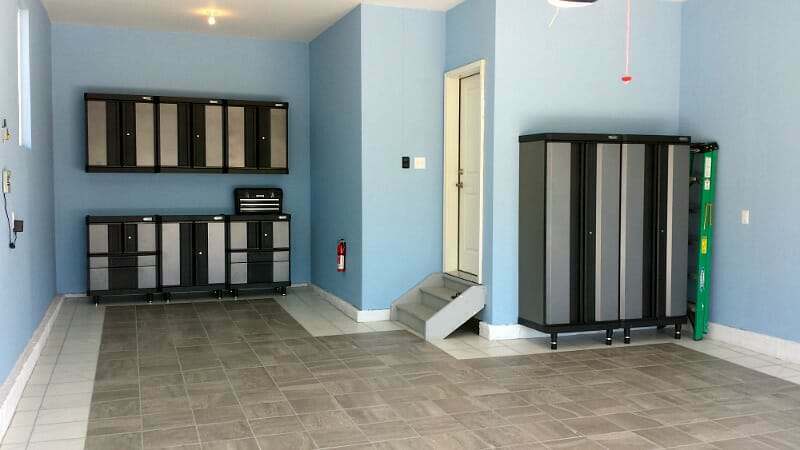 Choosing porcelain tile for the garage can be fun and overwhelming at the same time. There are far more sizes, colors, patterns, and textures to choose from compared to conventional garage flooring. If you have ever had to choose a tile floor for the inside of your home then you know what we mean. Cost is another consideration as it can run from less than $1 per square foot to well over $6 and more. Besides styles, patterns, and cost, you also need to choose the proper PEI rating for hardness, as well as pay attention to the coefficient of friction rating which determines how slippery the tile may or may not be when wet. For a garage floor you need a PEI rating of 4 or 5 for hardness. For slip resistance, a coefficient of friction rating that is greater than 0.50 is “conditionally” slip resistant while a rating of 0.60 or greater is considered slip resistant. 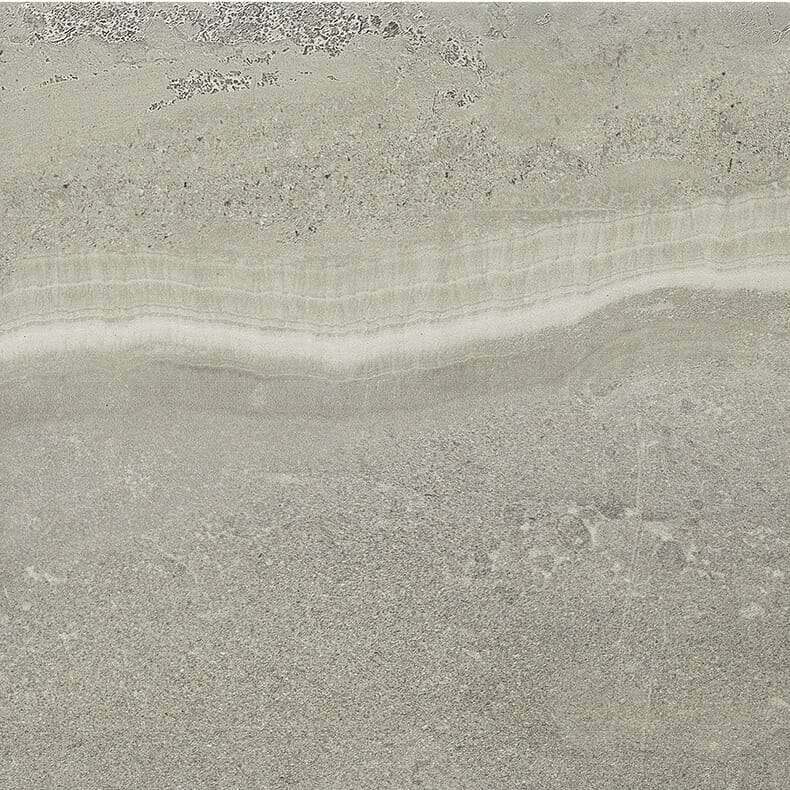 Tony and Carla chose a beautiful gray faux marble and a white faux marble porcelain tile from Lowes. The gray tile was used for the majority of the floor with the white tile on the surrounding borders. 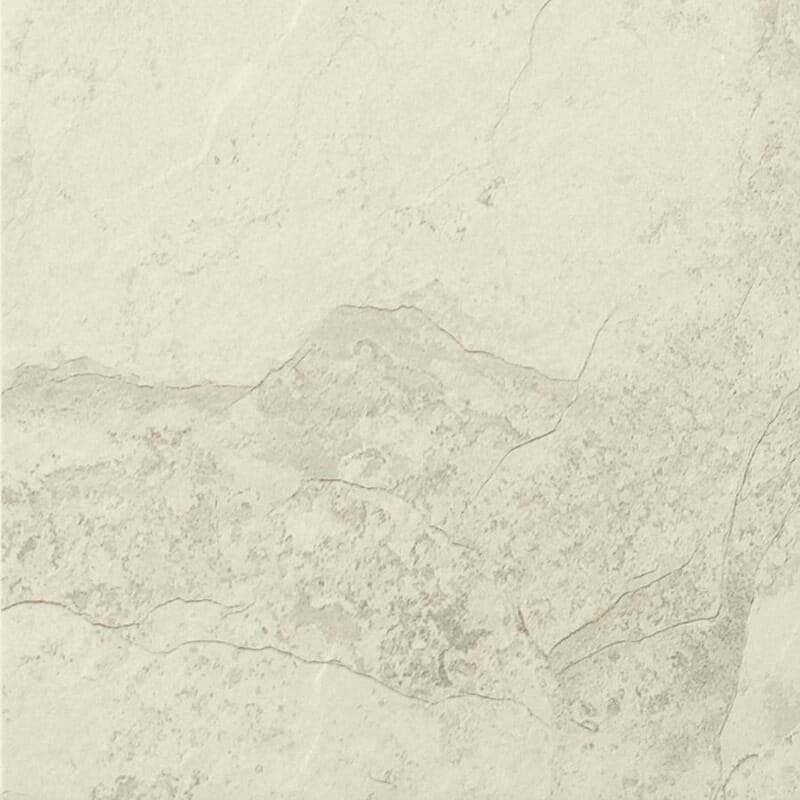 The tile has a PEI rating of 4 and a coefficient of friction rating of 0.42. Delorian Gray #165 by Polyblend was their grout of choice. The price paid for tile is always relative to what your budget dictates. 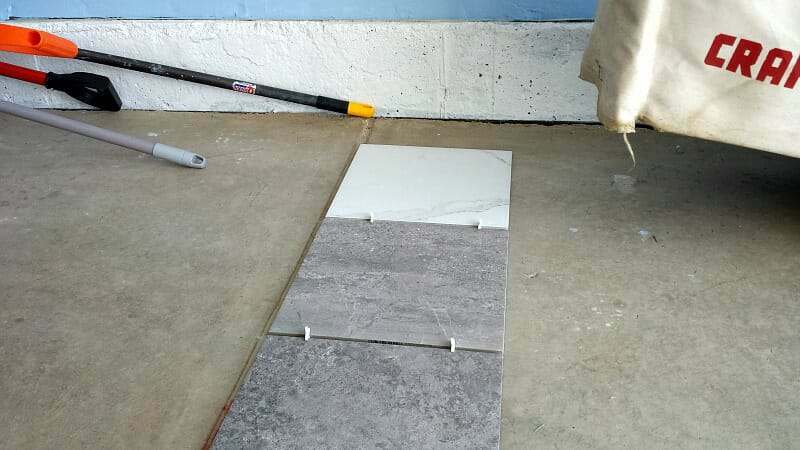 While you can find some terrific values in the $1 per square foot range for a garage floor, Tony and Carla paid $1.78 for the gray tile and $1.48 for the white. With all the choices he and Carla had, they felt this was a good deal for what they were looking for. Having done a few DIY tile installations before, Tony is not a novice. However, 484 square feet of garage floor was definitely his biggest project to date. Because he was not in a hurry to get the job completed, he and Carla teamed up together and took their time to complete the floor in a time span of approximately three weeks. They didn’t work on the floor every day though. Tony said they spent maybe 8 days total, some of which was only for an hour or two. Carla would back butter the tiles for him while he set them in the mortar. Before they started, they made sure to lay out some of the tile in order to figure out where to start. This allowed them to honor the contraction joints as well as center the layout as much as possible. This little bit of extra work can make a huge difference when you know exactly how the tile layout should go. Once started, Tony and Carla focused on completing the left side of the garage floor first. This enabled them to move their supplies and tools from the right side of the garage to the left as they went along. After they laid and grouted the last of the tile, they went about moving things out so they could clean the grout haze from the tile and do a final inspection of their work. One question that always pops up with a porcelain tiled garage floor is what to do about the transition from the concrete to the tile at the front of the garage. Most people use a Schluter Reno Ramp and this is exactly what Tony did here. You can see how the aluminum ramp makes for a nice transition and looks sharp at the same time. Tony’s floor has been down now since August of 2016. We asked him for a quick review of how the porcelain tile was holding up so far and if he would have done anything differently. We also wanted to know if he had any regrets. He said that they have already had some snow and other nasty weather that left the garage floor a real mess. However, after sweeping up the loose stuff and giving it a couple of quick mops, the floor easily cleaned up looking as new as the day it was finished. He thought the tile might be a little slippery when wet since it didn’t have an optimum non-slip rating, but to date it hasn’t been slippery at all. One thing he said that he may have done differently was to lay some of the white tile down the center of the garage to divide it up into two sections. 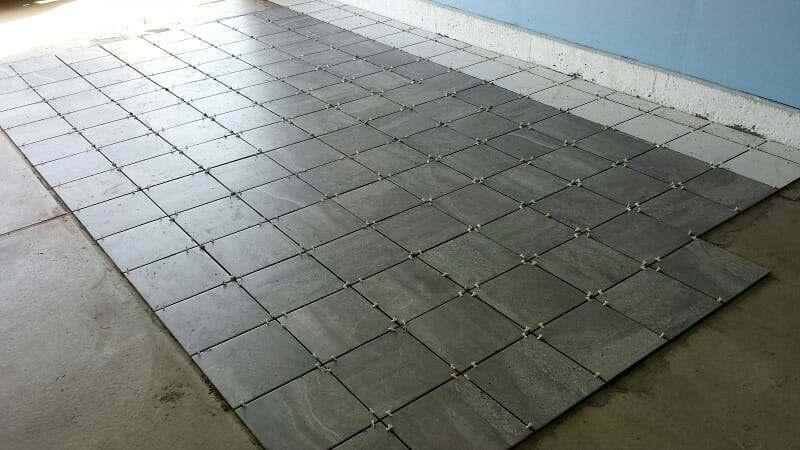 This is something that people who install interlocking plastic tiles tend to do and he likes that look. For some reason here in the U.S., there is this perception that tiles (no matter the material) would break in a garage. All we can do is try and dispel the myth, show what we’ve done, and encourage others to try as well. 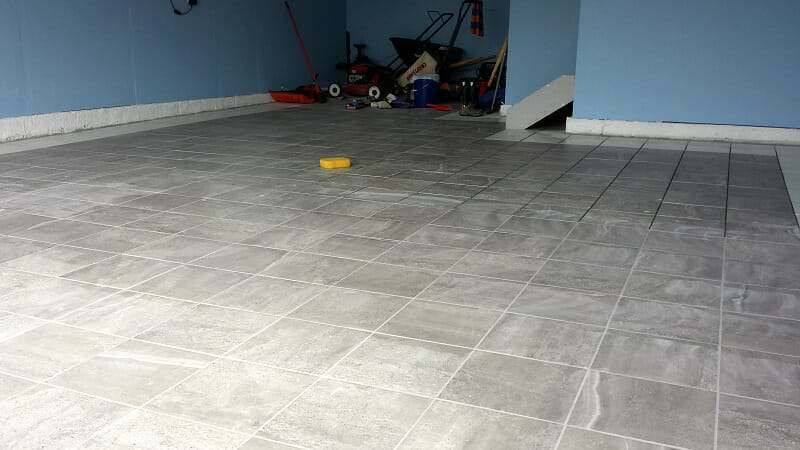 For more information about Tony’s porcelain tiled garage floor including a more in depth review of the installation, we encourage you to visit his blog Cheapest House on the Block. Feel free to contact him through his comments section if you have any questions. Tony and his wife Carla do a great job of documenting all of their DIY projects in their blog, including upgrades to their garage other than the flooring. Can a Porcelain Tiled Garage Floor do This? Great post, Shea. Thank you for featuring our work in your awesome website! Porcelain tiles looks good after finishing but i am wondering if it will be slippery if i opt these for my boat repair shop. If you choose a high coefficient of friction rating you should be fine. Anything 0.60 or higher is considered non-slip and meets OSHA and ADA requirements for a wet surface. How well does this hold up to a floorjack wheeling a car around? The reference to honor the contraction joint. I assume you should fill the contraction joint with epoxy, grind it flat and then place the grout joints over the contraction joint. Is that correct? Hi Jim. Since it is tile you will be applying, you can fill the joint before hand with a self-leveling underlayment, thinset, or some other cementitious product. We don’t recommend an epoxy filler since thinset will not adhere very well to it. Yes, honoring the joint means to place the grout joints over the contraction joint. Great thanks – is there a requiremetn of benefit from using an uncoupling membrane? Also is there a sealer recomended or required for the tile? No, uncoupling membranes are more for sub floors that can flex. Porcelain tile cannot be sealed. It is extremely dense and rated as impervious with a water absorption rate of less than .05%. This is why porcelain is so stain resistant.